IN PROGRESS. MORE TO FOLLOW SOON. 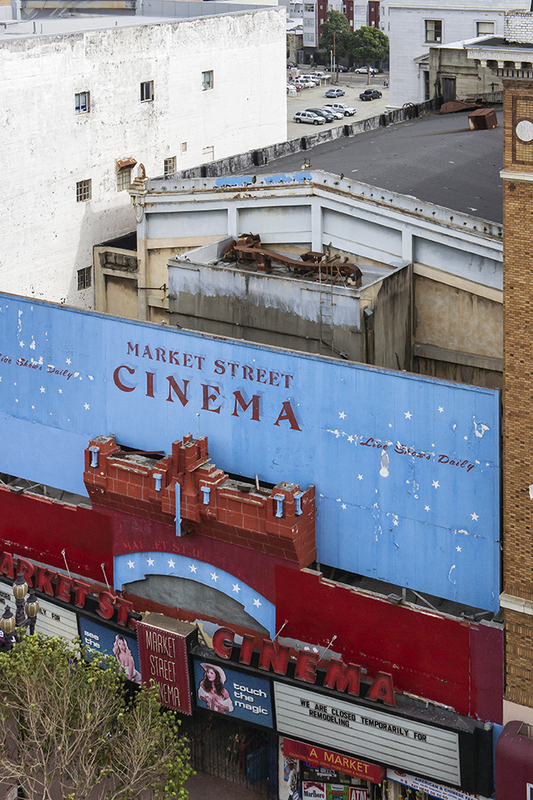 Contained within the Mid-Market area is the Market Street Theatre and Loft District, a National Register district listed in 1986. 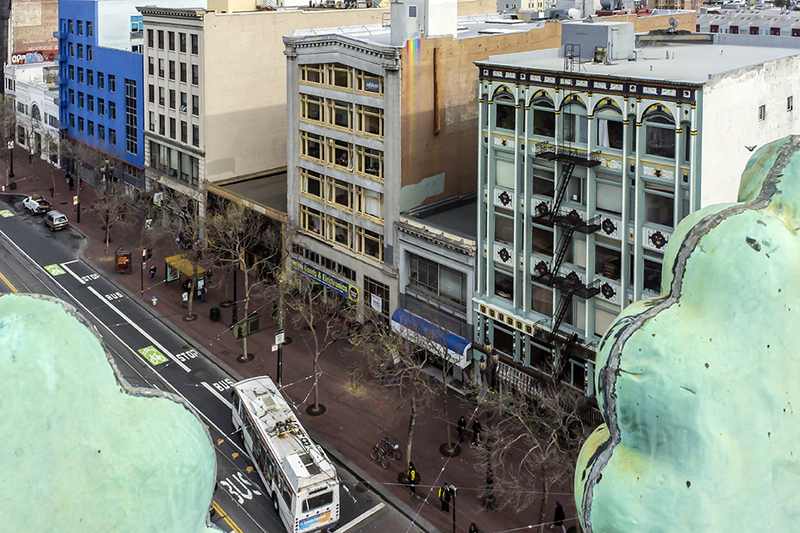 First identified in 1977 by Michael Corbett in Splendid Survivors, the district spans 982 to 1112 Market Street on the northwest side, including One Jones Street and 1-35 Taylor Street, and 973 to 1105 Market Street on the southeast side. Comprising the district are eight loft buildings, four office buildings, five theaters and two theater sites, two hotels, a bank, a fraternal lodge, nine small commercial buildings, and two fine intersections. Twenty of the buildings are contributors, the rest are intrusions. Constructed for the most part between 1900 and 1926, the buildings manifest a singular visual harmony, known as the Commercial Style, with two- or three-part vertical composition, Renaissance-Baroque or other historicist ornamentation, and prominent cornices. The architecture looks much like the rest of San Francisco’s post-fire downtown because the same architects and property owners were responsible. The district’s true beginning took place in 1889, when Albert Pissis published his designs for the Hibernia Bank, the City’s earliest surviving Beaux-Arts building, in California Architect and Building News. Highly admired in the 1890s, widely copied after the Fire, the Hibernia Bank was the progenitor of San Francisco’s Beaux-Arts classicism. Perhaps more than any other structure, the Hibernia Bank was enormously influential in San Francisco’s rebuilding. 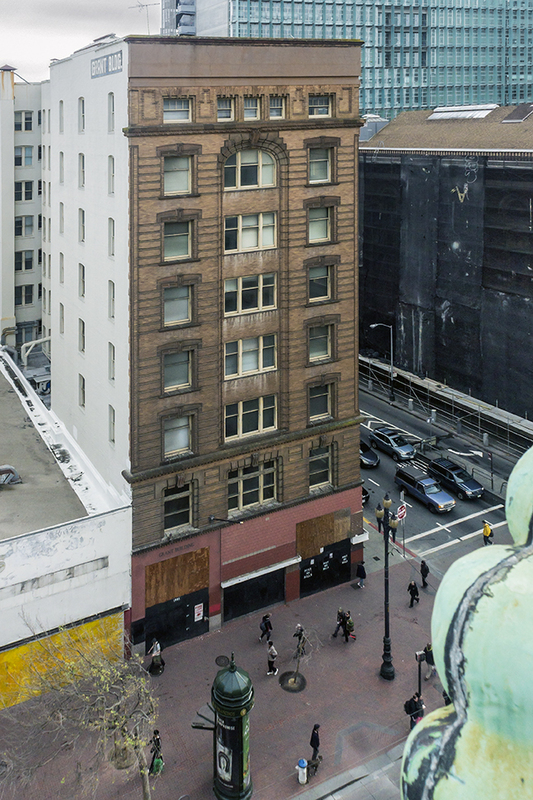 Four of the district’s contributing buildings, the Hibernia Bank (1889-1892) and the Wilson (1900), Hale Brothers (1900) and Grant (1902) buildings, are in varying degree survivors of the 1906 earthquake and fire. 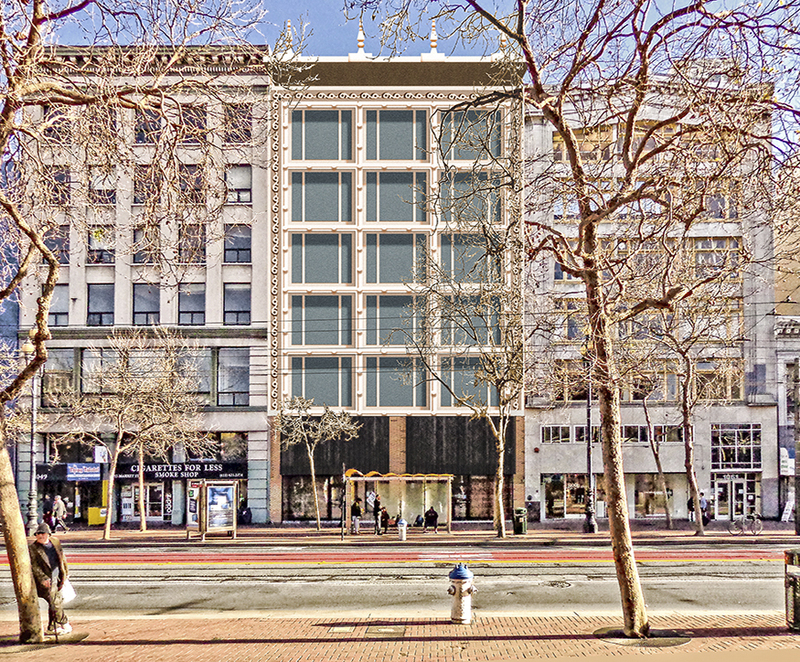 These four facades share the design qualities of the district and all of post-fire downtown, showing that foresight and preparation for San Francisco’s post-fire City Beautiful-inspired architecture were developed in the six to sixteen years beforehand. Of the district’s twenty contributing buildings, twelve were constructed between 1906 and 1913. Between 1920 and 1926, four more buildings were added, three of them theaters: the Golden Gate (1922), Loew’s Warfield (1922), and the Egyptian (1924). 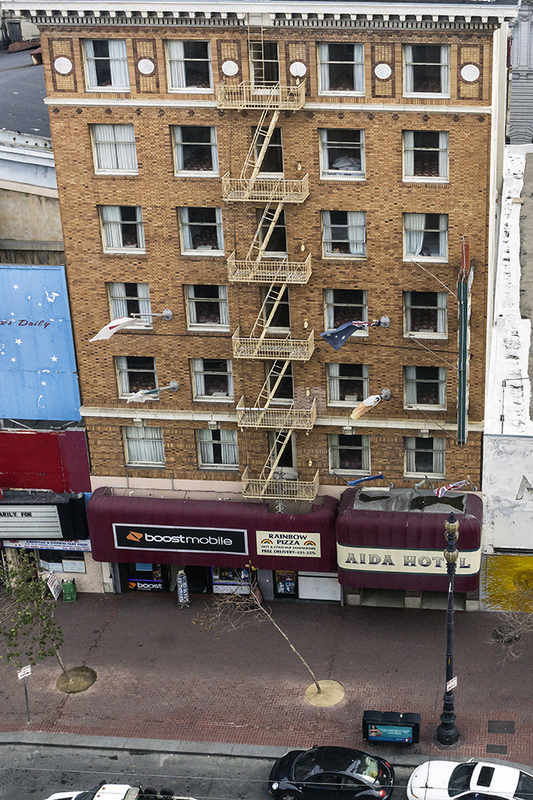 Pictured here are Weinstein’s Department Store (blue facade, an intrusion), Sterling Furniture Company, Kaplan’s (another intrusion), the Ede Building, Globe Building, and the Egyptian Theatre. 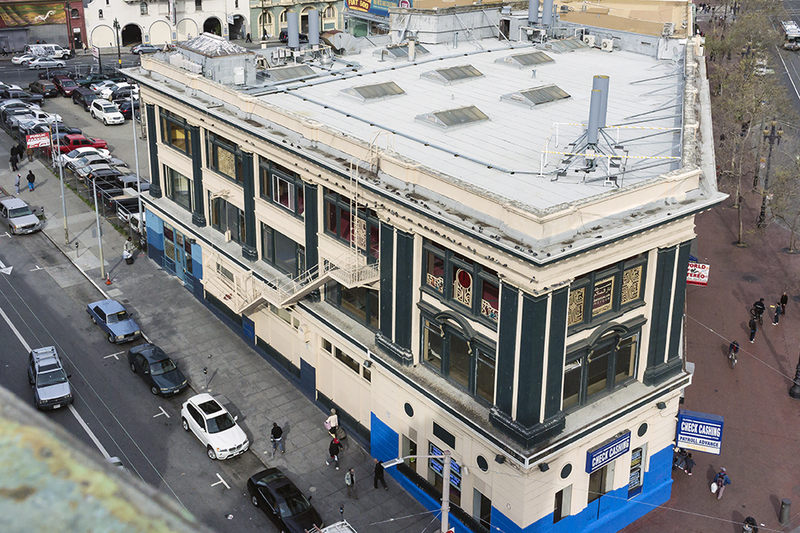 The two-story building of relatively modern appearance, known only as Kaplan’s Surplus in recent years, is all that remains of the 1908 Forrest Building, a fine seven-story loft building heavily damaged in a six-alarm arson fire that also damaged the Sterling Building next door on 04 January 1979. While the Sterling Building was repaired, Kaplan’s, the owner-occupant of the Forrest Building both before and after the fire, sadly decided to demolish and not restore, leaving only a pathetic two-story remnant. Now that Kaplan’s has closed up shop forever, the building will be razed and replaced by market rate, high-rise condominiums. My friend Mike Humbert, who is as engrossed with Market Street’s history as I, with great patience created this image showing the Forrest Building, unabbreviated, on present day Market Street. Michael Corbett likened the original facade to Frank Lloyd Wright’s Luxfer Project. Due to extensive alterations over the years, the Imperial Theatre numbers among the district’s intrusions and therefore lacks the protections afforded to buildings with historic status. Predictably, the building’s owners have decided to raze and not restore because high-rise condominiums will be far more profitable. Or so they hope. Sooner or later, the tech bubble will burst and with it the housing bubble. In the meantime, San Francisco is erasing its history at an unprecedented rate. This is my first comment on your incredible sight. There is so much I’d like to share with you about my time in San Francisco and some of our similar experiences, but that will have to wait for another time. I’ll just start by saying I arrived in San Francisco at the age of 21, after a Greyhound trip from the East to the West Coast, in January of 1969 and spent my very first night in the city in the Federal Hotel you have pictured here. Thanks so much for the visual memory. The next 3 1/2 years were spent in an SRO on Eddy St. Thanks, Joseph. Just be aware that it’s unfinished, though not for long.